October 20. Spent the couple hour layover in the Hong Kong business club, where I managed to post yesterday’s blog, AND learn that the Cubs had won. Three more to go. Uneventful 21/2 hour flight to Saigon allowed me to finish EXIT WEST, which was excellent. Since we left for the airport inChicago at noon on Wednesday, it was a bit surprising to be told to have a good weekend getting off in Saigon, but damn if it wasn’t early Friday. The international date line will do that to you. We were met by a visa service at the Saigon airport, which escorted us through immigration very efficiently. Our luggage was waiting and we were met at the airport. Standing outside a Burger King at the airport in sultry 80-degree weather, I joked to Chet that if the car didn’t come, we could get an Uber. He took out his phone, and, sure enough, we could indeed have Ubered to the hotel. Fortunately, that wasn’t necessary, as our air conditioned van arrived and drove us the twenty minutes to the very elegant Hotel Des Arts, where we checked in, showered and got some much-needed sleep, starting around 2AM in our large and lovely room. 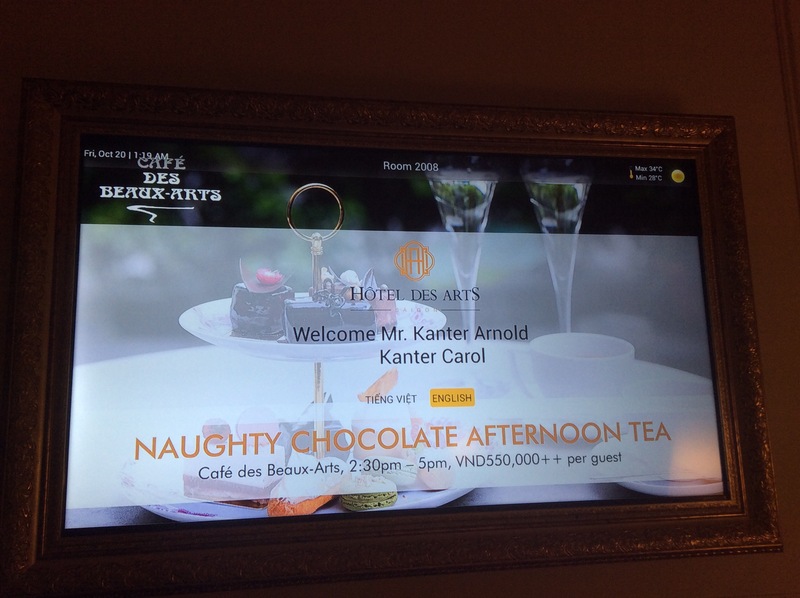 Here’s what appeared on the large, framed TV in our room. We passed by Norte Dame Cathedral, but could not enter because of renovations. 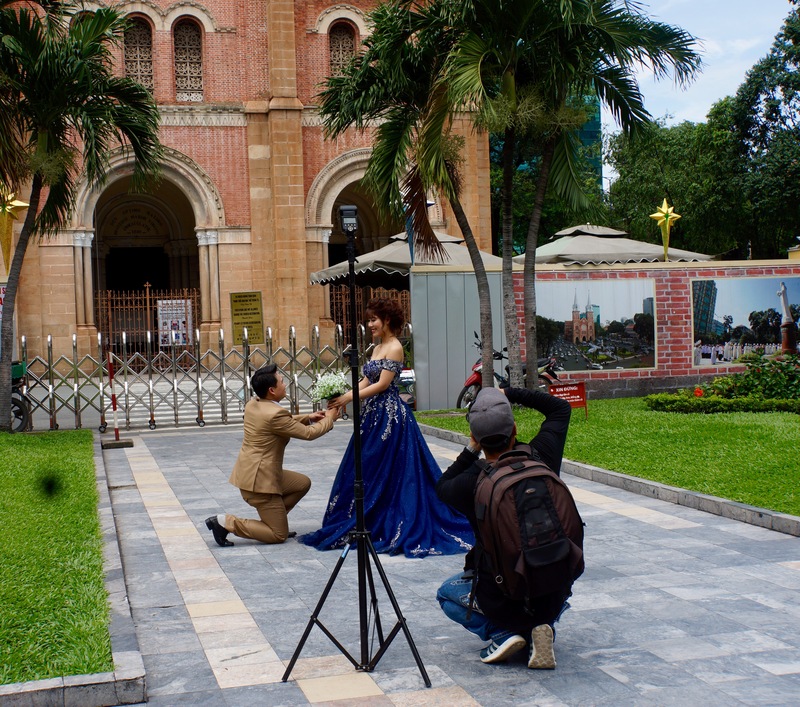 A bride and groom were posing for photos. 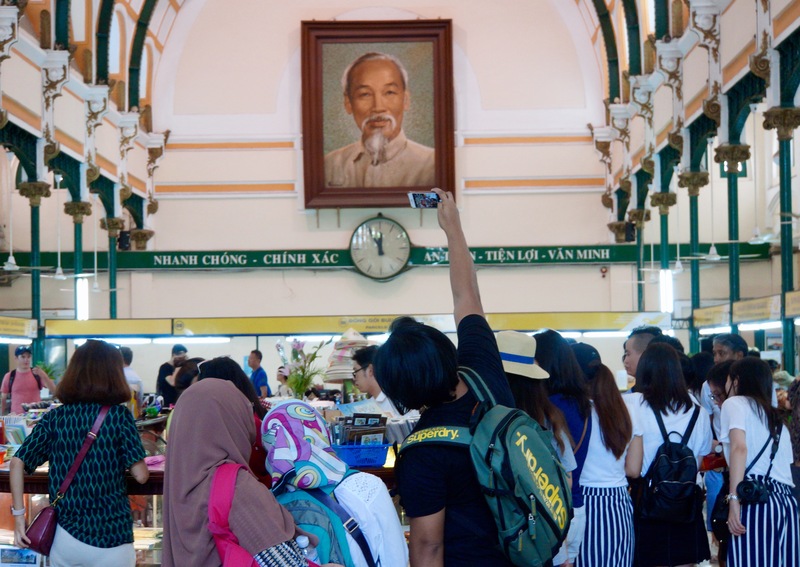 We crossed the street to the Central Post Office, built in the French Provincial style with the interior looking like an English train station–a beehive of activity with a large portrait of Uncle Ho at the far end of the station surveying the goings on. 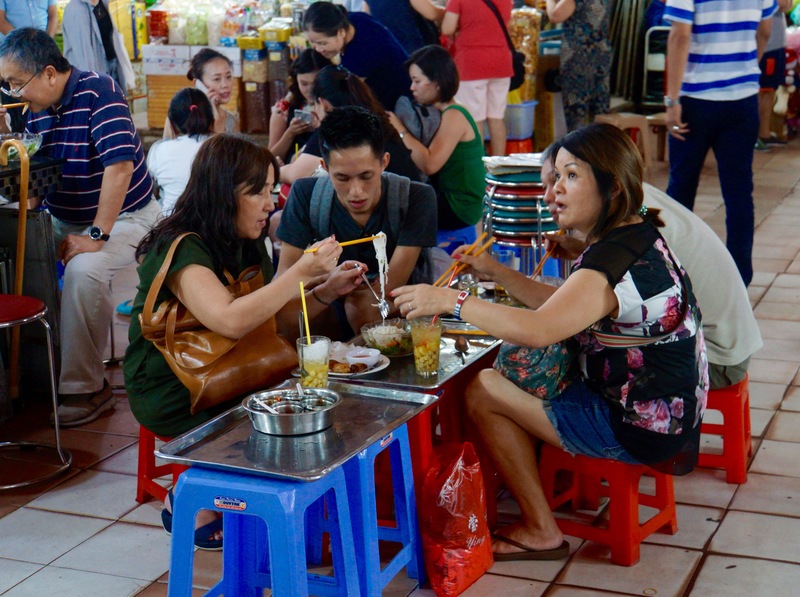 We stopped to walk through the large Binh Thanh Market, which was okay, but indistinguishable from markets we’d seen in many other countries that were more interesting. 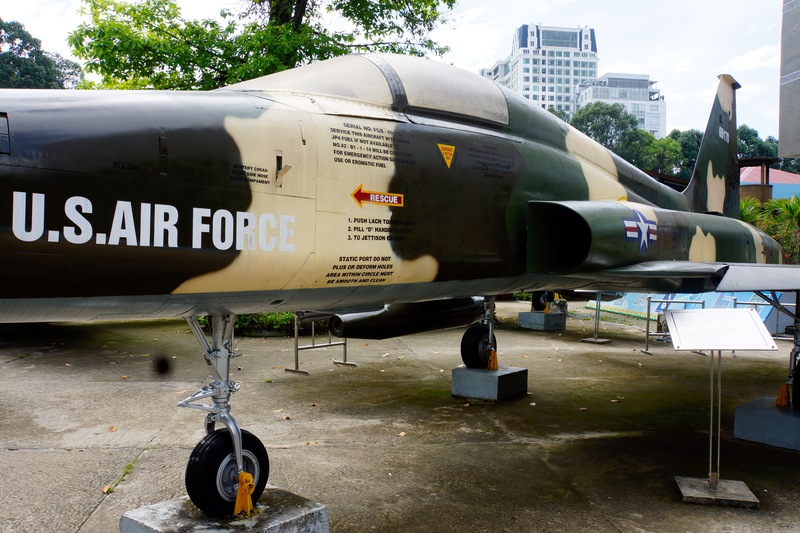 By far our most interesting stop was the War Remnants museum that told the unvarnished story of the American war of aggression against Vietnam. Outside were examples of various tanks, artillary, planes and a helicopter used in the war. Just seeing the size of the armaments and reading about the devastation they were capable of doing was striking. From the armaments we walked to an area that recreated the prison situation in which prisoners of war were held, together with photographs and descriptions of those tortured. 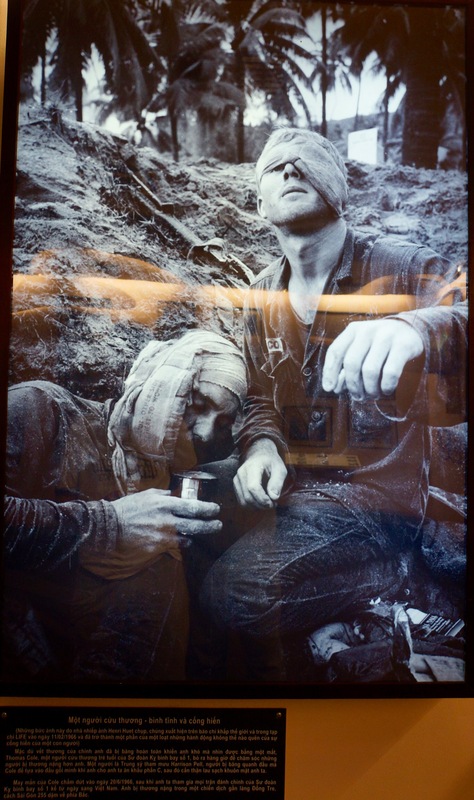 The most powerful parts of the museum, though, was the huge collection of absolutely stunning and devastating photographs, called “Requiem”, taken by many war correspondents from countries that were involved in or reported upon the war. 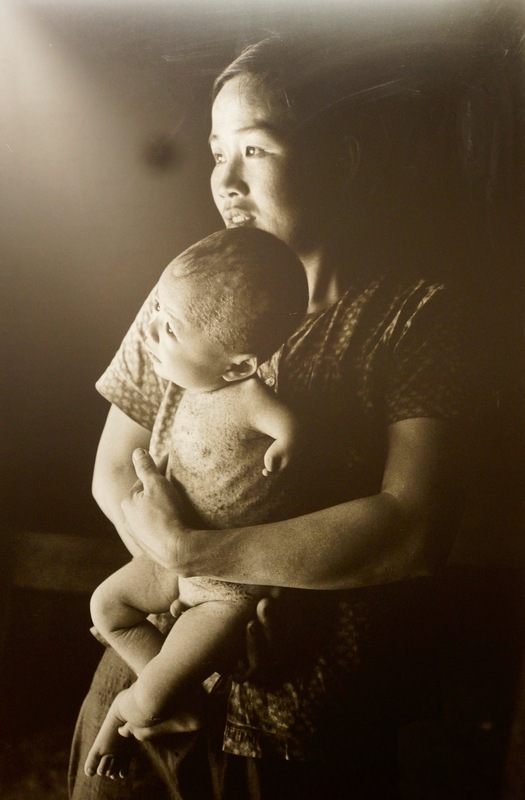 Added were more photographs of people deformed by our use of Agent Orange. 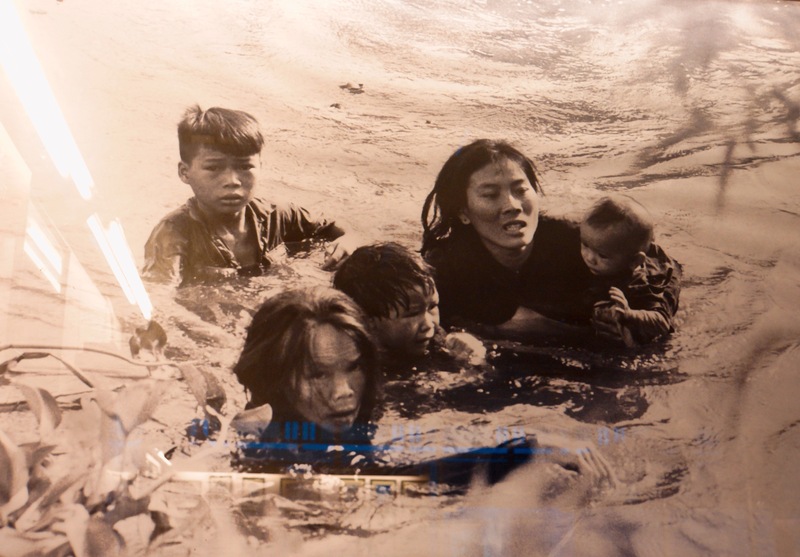 All of these exhibits provided a visual condemnation of war in general and the Vietnam war in particular. I could easily have spent at least another (quite uncomfortable) hour in this museum. 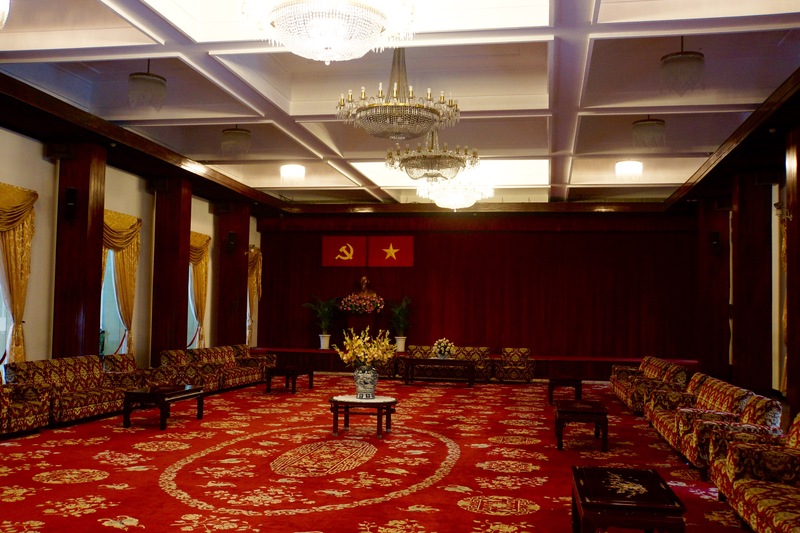 From the War Remnants Museum, we drove to the Reunification Palace, formerly called the Presidential Palace and toured the quite lavish, but rather tasteful, building, obviously built using US funds. We saw the various conference, dining, greeting and entertainment rooms, as well as the residential parts. 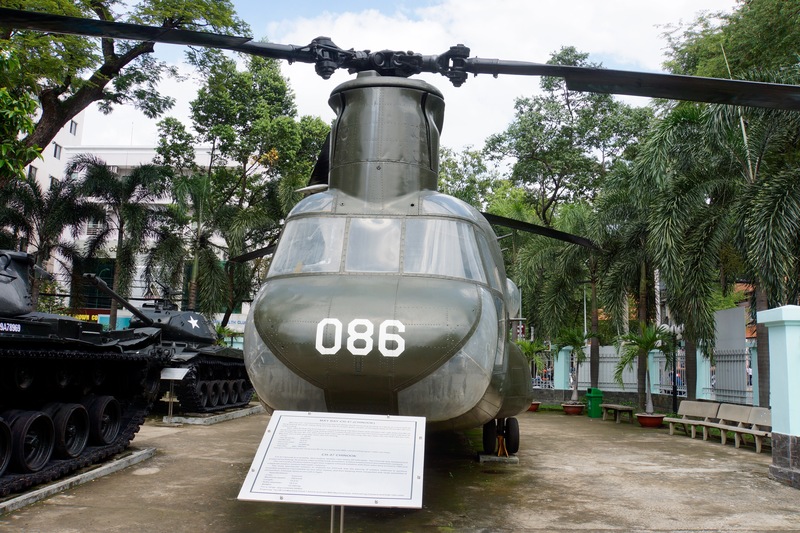 We were scheduled to go on to the history museum, but the extreme humidity, our relative lack of full recovery from our trip over and the fact that we will see a more complete history museum in Hanoi convinced us to request that we simply be dropped back at the hotel. We went back up to the 22nd floor where we’d had breakfast to have some soft drinks, cakes and dried fruits, then went to our rooms to relax before dinner. Back in the room, I discovered that, stupidly, I’d failed to take a cord that I needed in order to download photos from the camera to my iPad in order to include them in the blog. This accounts for the lack of photos with this post. Unless I’m able to get that cord from a camera store, which seems doubtful, I’ll need to take my iPad along and download some quite unsatisfactory photos for the rest of the trip. And this, on top of the Cubs loss, does not make me happy. Well, I had my adventure for the day. I asked the concierge whether they might find a camera store that would have the cord I need. They could not find that, but the store suggested that I get a card reader to accomplish the connection. So, the concierge called me an Uber to take me to the store. Heavy rush hour traffic, drizzle, Vietnamese music blasting on the radio, I’m driven to the camera store whose address the concierge has hand-written for the driver. I’m told that the one-way fare will be 71,000 dong, or just over $3. (Chet and I each became millionaires this afternoon by cashing $50 for over a million dong). We arrive at the place and the guy at the strobe has misunderstood. He thought I needed a card, not a card reader. He says I should go up the block and turn right. I don’t understand, so he explains to my Uber driver, who pulls up to the new store. I go in. The guy brings out a card reader, but it doesn’t work, not enough power. I need to connect to the camera, he tells me. I tell him that I don’t have the cord. I tell him I have a Sony NEX7. He gets on his phone, checks and says he has the cord. He pulls it out from the back and says that will be 35,000 dong, or about a dollar and a half. 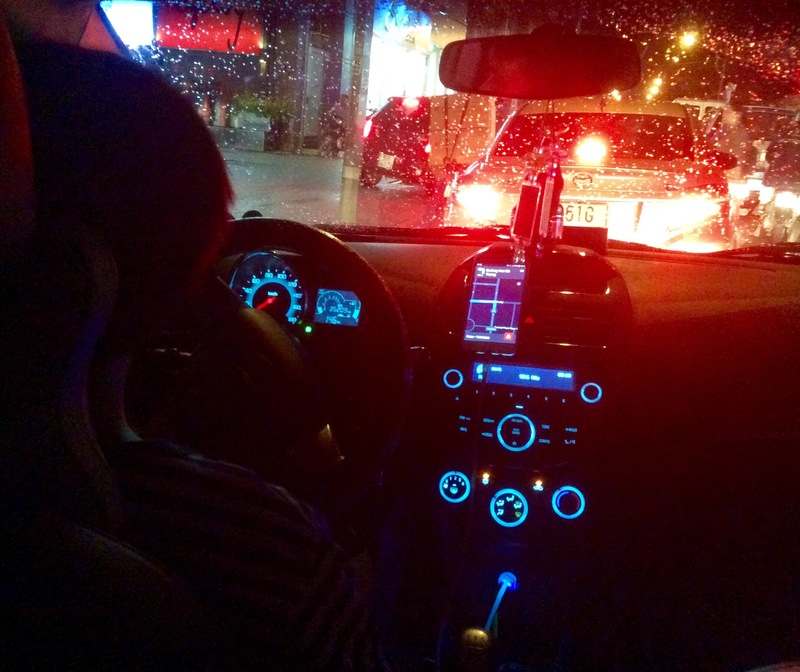 The Uber driver has waited for me and drives me back through heavy traffic. I give him 200,000 dong, less than $10. He’s happy. I’m happy. Return to the hotel in time for a quick shower, then off to dinner with Chet and Nancy in a very happening part of town at a very-hard-to-find French restaurant called The Temple Club, located on the second floor of an old house. Dinner is quite excellent, and we Uber back to the hotel and retire. So enjoy reading your blog posts Arnie. Your narrative takes me out of Chicago. Enjoy! Excellent post Arnie. I can’t say I ENJOYED reading about the atrocities committed by US troops but it’s a useful reminder, thank you. I hope we can hook up when you’re back in town. To fully appreciate what you are seeing, understand the tallest building in Saigon circa 1967 was the ten story Caravelle Hotel. The response I had on a return visit in 2005 was like Rip Van Winkle. Looks like capitalism won. Arnie. Seriously? You cannot say that I did not remind you to bring your computer cord. Glad you are all there safe and sound. Enjoy! Yes, but you didn’t pack it for me.